Manufacturers of electronic pressure switches often offer both PNP and NPN switching outputs. Here is a brief explanation how the two different outputs should be connected. In principle, both are bipolar transistors in which only the internal arrangement of the pn transitions differs. This is why the load must be connected differently to the transistor outputs. The load is connected to the switching output with GND as the reference point. When a change in signal takes place by reaching a pressure value, the supply voltage (U+) is “switched through”, allowing current to flow from U+ through the transistor and through the load to GND. The load is connected to the switching output with U+ as the reference point. When a change in signal takes place by reaching a pressure value, the supply voltage (U+) is “switched on”, allowing current to flow from U+ through the load via the transistor and to GND. 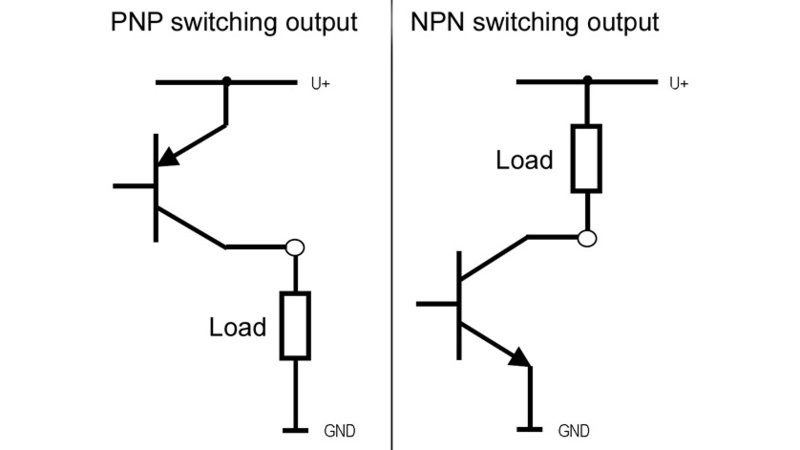 In my experience, PNP switching outputs are used mainly in Europe, and NPN outputs almost exclusively in Asia. In contrast, in North America, the country where the transistor was invented, relay outputs with potential-free contacts for AC 110 V loads are most widely used. The WIKA pressure switch PSD-30 is available either with PNP or NPN switching output. I have over 10 years experience in product management with WIKA for various products and industries. Nevertheless, there are new details and challenges to discover and learn every day. I would like to share some part of this knowledge with you in this blog and hope that, through this, I can assist you. What is meant by the “window” switching function with electronic pressure switches? What is meant by the switching function “hysteresis” with electronic pressure switches?